August 15: Joseph Marsh was born in Pickaway County, OH to John and Eliza Marsh. December 30: The U.S. Federal Census enumerated in Dewitt County, IL showed 15-year-old Joseph living with his parents and siblings. His father, John, was a farmer. October 31: Joseph married Margaret A. Day in Dewitt County, IL. July 30: The U.S. Federal Census enumerated in Dewitt County, IL showed Joseph, a farmer and carpenter, living with his wife Margaret and his young son, George. August 6: Joseph Marsh enlisted in the U.S. Army and was mustered in to Co. G 107 IL Infantry. His rank at enlistment was Sergeant. October 31: Joseph was promoted to Lieutenant. November 30: Joseph fought in the Battle of Franklin. June 21: Joseph mustered out of the U.S. Army in Salisbury, NC with his regiment. November 19: Joseph married Sarah K. Woods in Ottawa, Kansas. July 28: The U.S. Federal Census enumerated in Franklin County, KS showed Joseph, a carpenter, living with his second wife Sarah and children. March 1: The Kansas State Census showed Joseph, a farmer, and his family living in Franklin County, KS. June 3: The U.S. Federal Census enumerated in Ottawa, Franklin County, KS showed Joseph, a farmer, and Sarah living with their children. September 3: The Ottawa Daily Republic, Ottawa, KS. November 15: Joseph bought a building from the Quenemo Hotel Co. and he opened the Marsh House Hotel. May 2: Joseph Marsh applied for and was granted a pension for his military service. Joseph Marsh started a tradition that would last until he died. He held a Thanksgiving dinner honoring his and his comrades’ survival of the Battle of Franklin. The dinners were actually changed to December 15-16 after a few years because too many people had schedule conflicts for Thanksgiving. 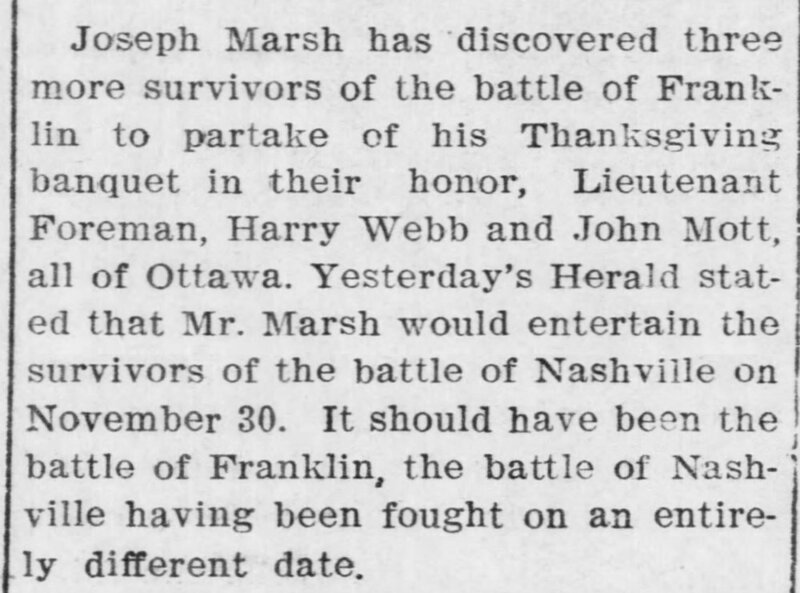 Franklin was not the only battle Joseph Marsh experienced, but it did leave a lasting impact in his memory, which is clearly illustrated in the following newspaper articles. June 6: The U.S. Federal Census enumerated in Ottawa, Franklin County, KS showed Joseph, a hotel keeper, and Sarah living at the hotel with eight of their children and many employees who lived on site. December 17: The Evening Herald, Ottawa, KS. November 13: The Evening Herald, Ottawa, KS. November 15: The Evening Herald, Ottawa, KS. November 30: The Ottawa Daily Republic, Ottawa, KS. April 21: The U.S. Federal Census enumerated in Ottawa, Franklin County, KS showed Joseph, a hotel landlord, and Sarah living at the Marsh House Hotel with four of their children and many employees. May 16: The Evening Herald, Ottawa, KS. May 25: Joseph’s widow Sarah applied for and was granted a widows’ military pension.